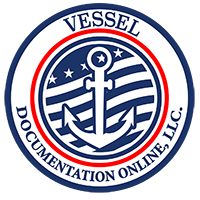 A vessel may be deleted from documentation upon the request of the vessel owner or an authorized agent on behalf of the owner. The request must be in writing and must include the vessel's official number and reason for deletion. The original Certificate of Documentation (CERTIFICATE OF DOCUMENTATION) is to be returned by the owner named on the certificate. Please provide evidence of sale or transfer AND a statement indicating nationality of owner and/or country in which vessel will be flagged (in the event vessel is being sold to non-US citizen(s) or being flagged in a foreign country). Evidence of sale is required in the event vessel is sold foreign as per 46 CFRn67.171(c)(1). A Certificate of Documentation (CERTIFICATE OF DOCUMENTATION) is invalid and the vessel subject to deletion from the roll of actively documented vessels when any of the situations listed in 46 CFR 67.171 occurs.